Cody had class yesterday until about 2:00 PM, so until then I was on my own. Of course, I updated the blog, and then I ventured out to take some pictures. First stop, the beautiful BYU-Hawaii Campus. 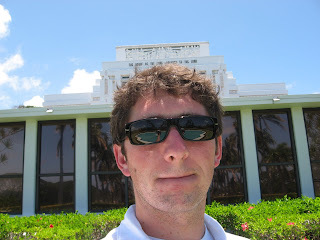 Next, I ventured over to the temple, which is right next to BYU-Hawaii. 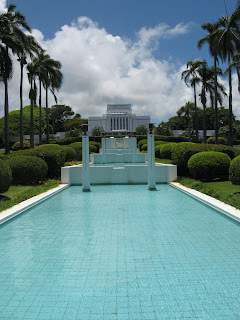 I thought I would show you all some views of the temple you'd never see unless you were here. At least, I know I've only seen it from one angle. I had to throw a self-portrait in! 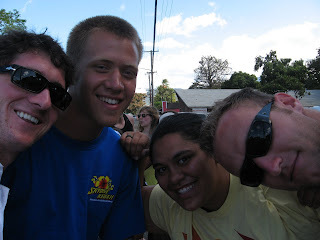 Next was Hukilau, a favorite among the college kids. 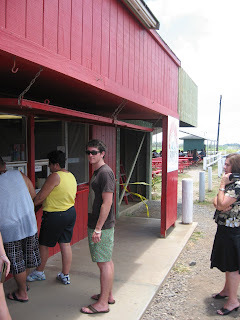 After that, I went and got some food at the local L&L. 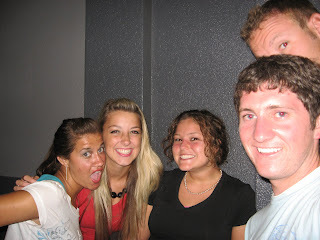 By then, Cody was done with class, so we rendezvoused at his place and headed out on the day's activities. 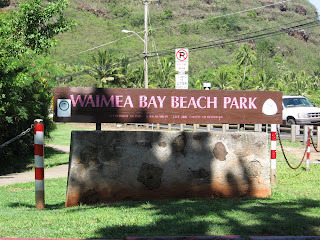 Our first destination was Haleiwa, but that didn't stop us from stopping along the way to take some pics and take in the sights. This is Kahuku, where Jack Johnson went to high school. 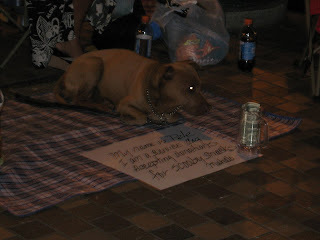 His music dominates the radio here in Hawaii. 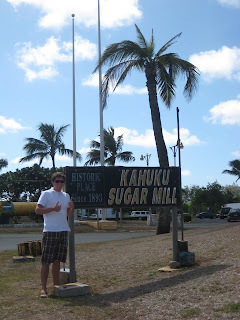 The Sugar Mill, made famous by Jack Johnson's song, "Mudfootball." 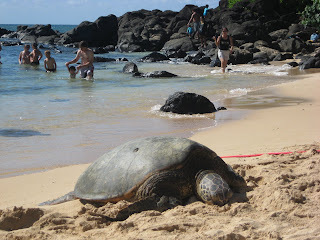 Up the road from Waimea, we found a beach where sea turtles hang out and catch rays. 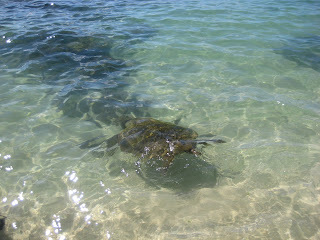 We'll definitely be going back there for some snorkeling and sea turtleing. 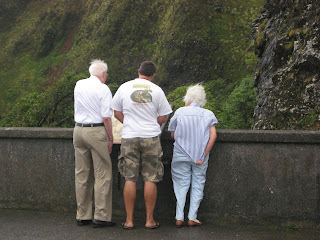 These are my new friends, Mike and Lena. Mike's from Kansas, Lena's from New Zealand. My first night here, I ate dinner with people from the following places: Australia (born in New Zealand), Arizona, New Zealand, Japan, Malaysia, Tennessee, Missouri, and probably a few other places I don't remember. BYU-Hawaii's very diverse. 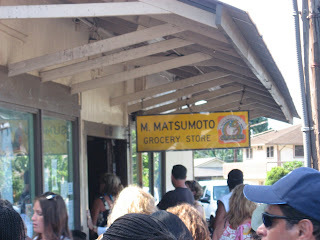 Next stop was the north shore town of Haleiwa and Matusmoto's Shave Ice, world famous in the world of shave ice. Tom Hanks, Adam Sandler, and, of course, Jack Johnson have visited and subsequently had their pictures placed on the wall. Here's one more picture for the wall, Matsumoto's! Have you ever seen such a complicated procedure. 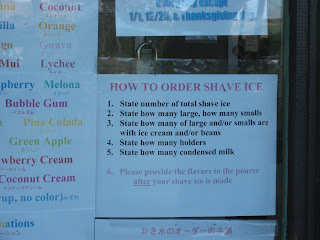 Leave it to the Japanese to make an efficient shave ice shop. 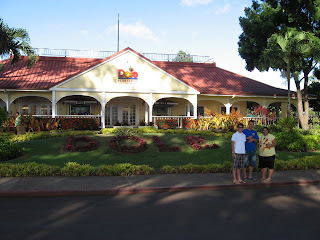 After Haleiwa, we headed to the Dole Plantation. 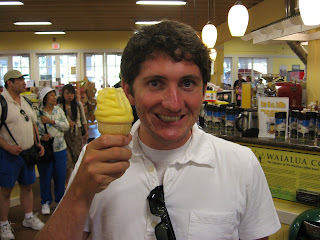 My whole life, I thought I could only get Dole Whip at Disneyland. Yesterday, my reality was put in check when I found a second place on the planet to purchase the delightful treat. I should've known. You're a sly businessman, Mr. Dole! I was almost as excited to get this as I was when I found out Vampire Weekend was playing in Hawaii. 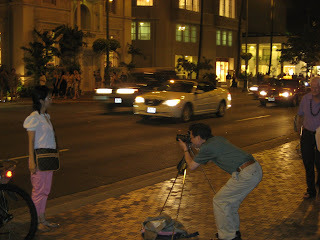 After the plantation, we headed into Waikiki. 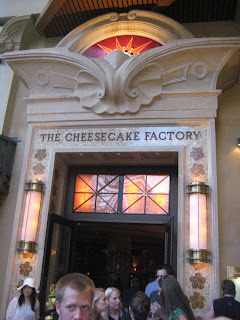 Yesterday was the Cheesecake Factory's 30th anniversary, and to celebrate, all of their cheesecake was only $1.50. 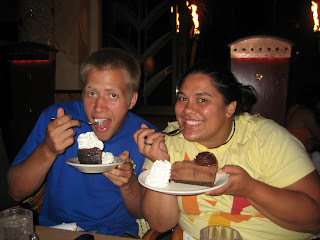 I hope my friends in the mainland took advantage of the boon that is cheap cheesecake from the Cheescake Factory. The food, unfortunately, was regularly priced. 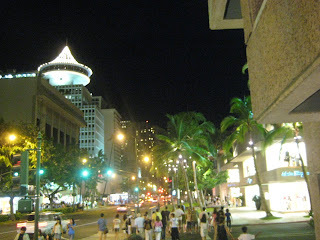 And now, the craziness that is Waikiki at night. 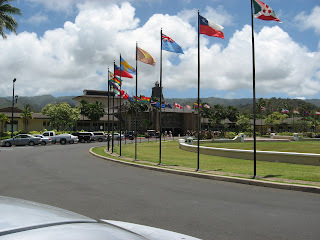 Today we're going to the Polynesian Cultural Center, the Disneyland of Hawaii. I'll let you know how it goes tomorrow. 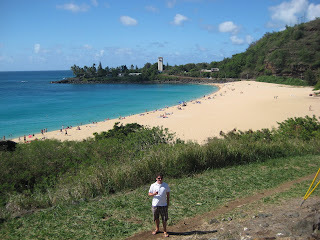 We left campus yesterday around noon and headed to the beautiful North Shore. During the winter, surfers from around the world flock here to take advantage of the massive surf, or "wild water," as they call it. Between October and February, the shore might greet you with something like this. It reminds me of one of my favorite quotes from the movie Orange County: "Lonny always said he wanted to die eating foam in a massive wipe out." In the movie, Lonny's wish came true. 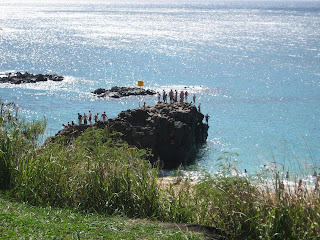 Luckily, during the summer, the waves disappear (almost), making the north shore just another ideal spot for swimming, snorkeling, and catching some rays, all of which I did yesterday. 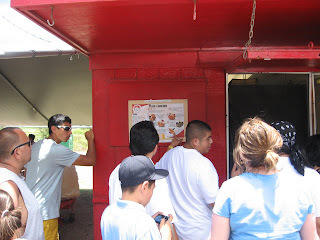 Before we hit the beach we stopped at a little shrimp shack in Kahuku. 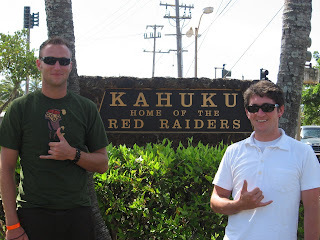 Kahuku is where Cody's dad went to high school. The musician Jack Johnson also went there. If he wasn't on tour in the mainland, I just know I would've seen him. 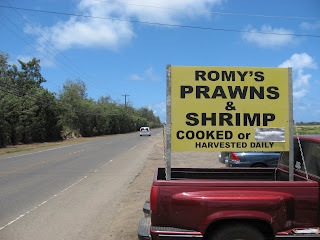 Romy's Kahuku Prawns and Shrimp, Inc. The line was really long, and naturally I was the last one in it. Don't you hate being the end of the long line? You almost wish that people would keep flocking in just so you don't have to be the only one to endure it. Just ignore the really white guy standing next to the guy that's been in Hawaii for five weeks. 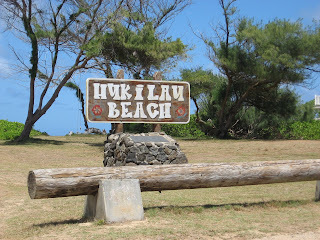 After hitting two or three beaches, we went to the Turtle Bay resort. The beach there is public access. 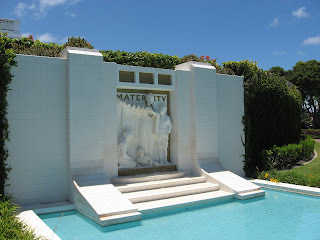 The pool, however, is for registered guests only. We went to the pool, but as we were trying to remain inconspicuous, no pictures were taken. Let me just tell you that the resort was breathtaking. This one I googled almost does it justice. After Turtle Bay, we went home to wash the sand out and get ready for Vampire Weekend. 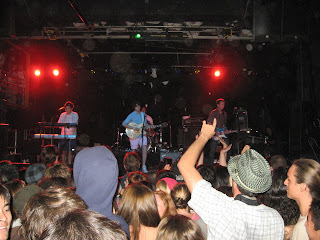 This was their first show in Hawaii. I felt very privileged to have been the biggest fan in the room, having seen them in the mainland and here. You're welcome, Vampire Weekend. We went with three girls Cody knows from school. 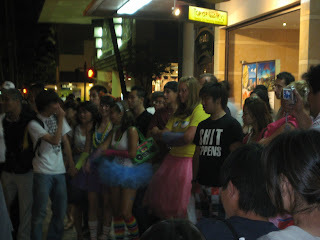 The show was at the Pipeline Cafe in Honolulu. 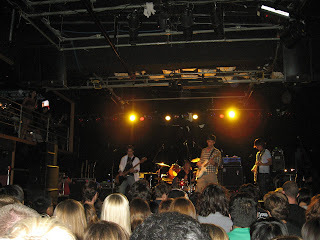 The opening band was Linus, the only all-Asian rock group that sings in English I've ever seen. 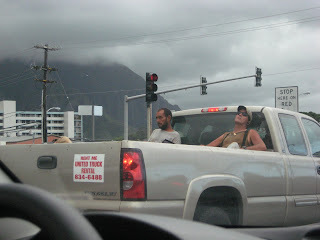 Only in Hawaii! 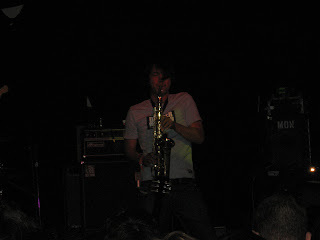 They made good use of the saxophone. The ironic part is that Linus has been together for six years, while Vampire Weekend formed in 2006 and released their first album less than a year ago on 29 January 2008. Poor Linus. Anyway, I sure like 'em. Now, I know that I formerly swore off of concerts until November or Weezer at the end of this post. I decided that Vampire Weekend in Hawaii was an exception. I'm on vacation! 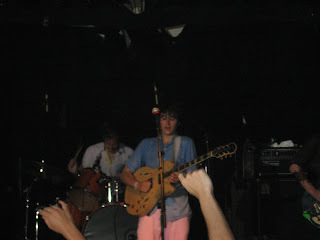 Also, I know that some of you hear the name "Vampire Weekend" and think about these. Be assured that Vampire Weekend concerts are devoid of fangs, blood, and people that shimmer in the sunlight. They formed at Columbia University in New York, and sing upbeat songs that sound like a cross between Weezer, the Beach Boys, and Elvis' Blue Hawaii, with a pinch of African vibes thrown in. 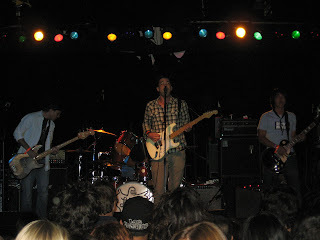 The band's name is derived from a movie that the lead singer made while in college. That's about as Vampire as they get. Welp, I'm off to enjoy Hawaii now! So, yesterday was the big day. I went to bed at 1:30 AM Utah time (9:30 PM Hawaii time) and woke up two hours later to go to the airport to catch my early morning flight to San Francisco, the first stop in my flight path. When I showed up to the airport, there was nobody at the counter to check people in. There were automated machines, but because my name is similar to some terrorist's, I am not able to check in via machine. I have to speak with an agent. So at 4:04 AM, I thought my trip was off because no one was there to clear my name. They finally showed up at 4:20 AM, only to find out that in fact I don't look like this. In San Francisco I had a two hour layover. I spent a fourth of that time roaming the airport looking for a McDonald's. I searched and searched, but was unable to find said fast food establishment. Upset, I settled for a subpar breakfast sandwich elsewhere, continued waiting, and finally, just when I thought it would never happen, boarded my plane to Hawaii! The flight was uneventful. Upon landing, I decided the airport and surrounding area in Honolulu look a lot like LAX. The one major difference is that half of the airport is outdoors. The terminals are indoors, but the hallways were more like outdoor walkways. So, as soon as I got off the plane, I walked outside to go to the baggage claim. After picking up my luggage, I proceeded to wander until I found the stop for rental car shuttles. 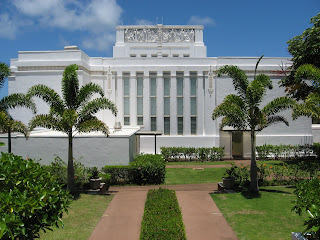 Cody was originally going to meet me at the airport, but he missed his bus in Laie. He showed up after I got the car. Good thing he didn't show up on time, though. If he had, I wouldn't have had my first Hawaiian Sammy's experience. As I waited for him to arrive, I circled the airport a few times. 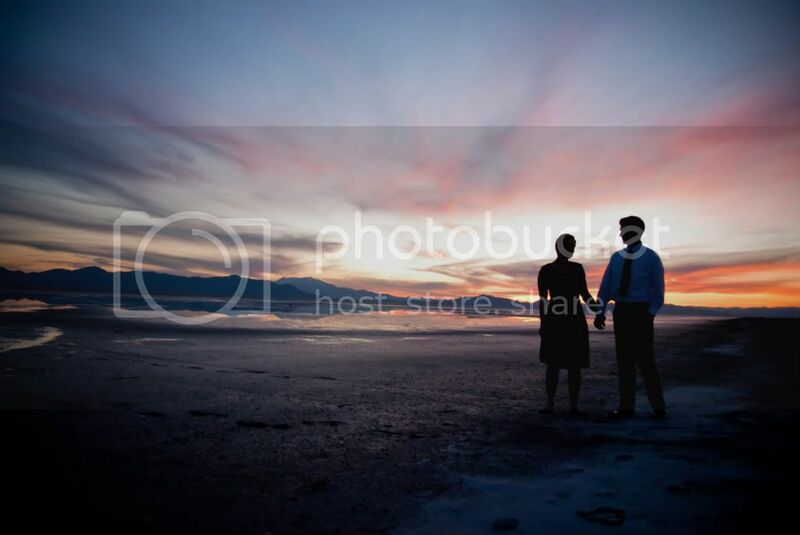 On my second go-round, as I drove past the American baggage claim/pick-up area, I looked out my window and saw a guy I thought looked a lot like a guy from my mission. I kept staring, and then realized that it was him. I was so confused by what had happened that I didn't even think to stop or roll down my window. I just kept driving and staring. Luckily I had his number in my phone, so I called him once I realized what had happened. He's here with his wife on a family reunion. I can't go anywhere without things like that happening, and I love it. Shortly after that uncanny experience, Cody showed up. 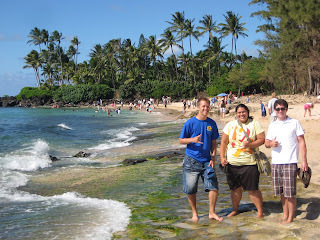 Our first stop was Waikiki beach. We drove down there, parked the car (which took quite a while), and went into the water. It was beautiful. After an hour or so there, we went back to the car and tried to find our way back to Laie. Traffic was pretty bad, and the roads were pretty confusing, but one thing we had going for us was the fact that we were on an island and couldn't possibly get that lost. 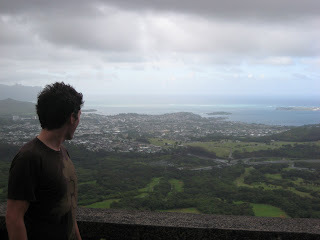 On the way back to Laie, we stopped at Pali Lookout, which was super windy. 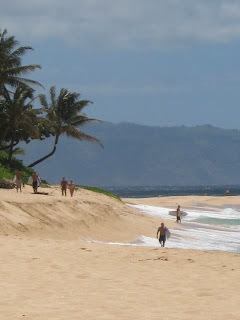 This picture overlooks the town of Kane'ohe, which is on the northeast shore of the island. I don't know how fast the wind blows up through there, but if the picture of me doesn't demonstrate how fast it is, I hope the next picture does. You can see their hair. If that's not enough, if she wasn't holding on to her shirt, it would have been long gone. The views are breathtaking here, everything is super green, and all the people are very laid back. 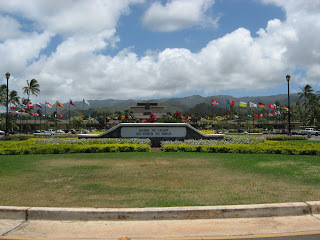 When we got to Laie, Cody gave me a tour. 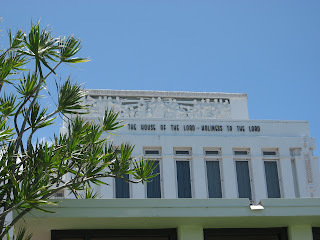 We drove past the temple and around campus. Last night we ate at the cafeteria and even went to FHE. I could really get used to the island life! For two summers now, the parking garage under my complex has been plagued by what I believe to be a malicious, conspiring, and contriving family of swallows. In some parts of the world, the return of the swallows is a joyous occasion, anticipated and celebrated yearly by news media and Catholic priests alike. The return of the swallows here in Utah, however, is not so joyous. 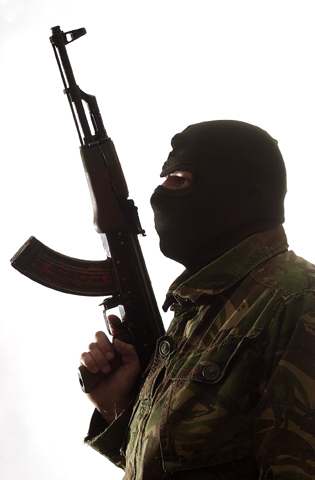 There are no parades, and the news media doesn't even seem to notice. All we have to look forward to are early morning scares by eager swallows out for a bite to eat, and, of course, their leftovers. I'm not exactly sure why they don't go find a cave somewhere up in the mountains. Our garage is not a hospitable place. There are people coming and going at all hours, and the lights down there never turn off. On top of that, I scare the birds (to make up for all the times they've buzzed my head) every time I pass their perch. I thought that after all the times I scared them last summer, they wouldn't return this year. I was not so lucky. They returned, and they are staying longer than expected. Mom and dad already flew the coup, but their ill-intentioned offspring have claimed the nest as their own, and may even be settling in for winter. For now, I'll be redoubling my efforts to make sure these plague-covered, winged rats don't stick around much longer. And don't think I'm not going to knock that nest down as soon as they're gone.